Happy New Year everyone! We celebrated by visiting Chihuly Garden and Glass in Seattle on New Year’s Eve, and I thought this photo I took of their glass flowers was a perfect fireworks display to usher in the new year here on the blog. As 2016 begins I would be remiss if I didn’t reflect back on 2015 – especially since I’ve loved reading so many other year-in-review posts. For me 2015 was an interesting year. My hopes and dreams for my sewing and blogging were just as big as they had been in the past, but the total time I was able to put into both of these creative pursuits was far less than ever before. Instead, I found myself consumed with toddler stuff, house projects, and science. That isn’t a bad thing, since I really enjoy being a mom (far more than I could have ever imagined! ), since working on our house is fun (need your copper plumbing fixed? I’m your gal! ), and since science brought in a small paycheck and resulted in a published paper (in a great journal!). But, there’s something rejuvenating about time spent purely being creative, and I missed out on a good bit of it! That’s not to say that I still didn’t make a little time for both sewing and blogging. Over the past year I refashioned two garments; I made a shirt for my husband; I made three dresses – including a wrap dress and a dress from the new Boundless Style book that taught me what I like in a dress; I made three tops, my favorite being my new Renfrew; I did some sewing for my little girl, with her Halloween costume again being the highlight; I made five running skirts; and I made a pink elephant for a baby shower gift. And, I kept up with my blogging as I went, even if I did start three posts for every one that I published. I have two skirts on my sewing table right now that I’ve been slowly working on since the beginning of December. They’re both cut from an A-line skirt pattern that I’ve made before (and that is probably my most worn skirt ever! ), and I was hoping to have these skirts finished in time for the holidays – one for Christmas Eve and one for New Year’s Eve. I was sure I’d be able to finish them in no time! I was also hoping to write some in-progress posts about the making of these skirts. Once upon a time hopes like that translated really well into actual outcomes. I was good at organizing my time to make sure of it. Since it really all does come down to finding the time, I’ve begun to wonder if I could squeeze in a bit more time to sew if I found a way to sew in our family space. I have been sewing in our unfinished basement, and it’s currently where we’re storing all of our tools and lumber for our home renovation projects, which means it’s just not a good place to have an almost two year old running around when she doesn’t have my full attention. I originally chose to sew in the basement because I have oodles of space and because I can leave a project in whatever state it happens to be in (aside from under the iron with the iron on!) when I have to pause my sewing without worrying about the mess. But, I’m starting to wonder if I should move my sewing machine into the dining room (an idea first suggested to me by G Marie of G Marie Sews way back when). We’re renovating our kitchen and have turned an extra bedroom into a makeshift kitchen, complete with a small table and chairs, which means our dining room isn’t in heavy use right now. That should make the dining room a perfect spot for sewing, but I’ve been hesitating since at some point (soon?) we’ll be busting through the dining room wall, and then the dining room will become a construction zone, which will make it not so perfect for working with cloth! 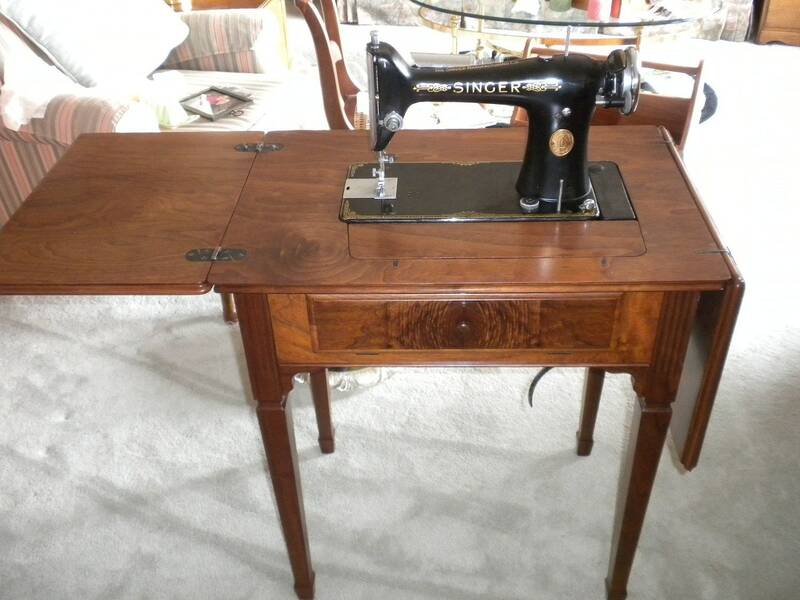 Now that I think about it, I really wish my Grandma’s vintage Singer machine, which was built into one of those wooden tables and could be tucked away (like this one), hadn’t been stolen since I could probably sneak that into the living room permanently! Resewlution #1: Move my sewing machine to the dining room to see if my sewing productivity increases. Nice roundup… I really like your running skirts! And your pink Renfrew. Your Boundless dress is very nice as well! Happy 2016! Thanks! Happy 2016 to you, too! A lot of you have suggested a rollaway cart, and I’ve begun to look into the idea. I really wish the basement felt more like a room, but since access to the basement is off the kitchen, and the kitchen is currently off limits, it feels like a very separate space. Maybe once the kitchen is finished, we’ll be able to turn that space into something more usable! You’ve had a productive year! Thanks! It doesn’t feel as productive as some, but I guess when you count everything – sewing, science, house, and toddler – it has been productive! You let the baby play in the living room/dining room, why shouldn’t you? When my girls were little I sewed on a desk in my bedroom. Of course I was single then and didn’t have to worry about keeping anyone up! While the basement floors were being done and right after one of Jay’s surgeries – I sewed on the dining room table. You’ll find what works for you. How is the house coming along? Happy New year 🙂 I really enjoy reading your blog. Enjoy 2016. Thanks! I hope you enjoy 2016, too! You’ve got a strong color scheme going in these pics! My sewing space is in our living area, and I second having a rolling cart or something like that (maybe a little three-drawer unit, since that might be less tempting to baby girl?) where you can stash your most-used notions. You could keep all the cutting-out stuff in the basement, since that requires some space. It’s worth experimenting! I sew in the living room since we’re in an apartment, but I actually quite enjoy it- I don’t like being all by myself. The clutter is the downside, but you could probably contain some of that in the basement. Oh my gosh. I do have a strong color scheme. I had my colors done on a whim at the beginning of the year, and I was really trying to take advantage of what I’d learned throughout the year, but I hadn’t realized I’d essentially stuck to pink and blue for e.v.e.r.y.t.h.i.n.g! How about a cart with wheels for your sewing machine? I found one in a thrift store for $20 and use it. Just make sure to get one that’s built with and open front, so you can put your legs under it. Thanks! Someone else mentioned a rolling cart, too, and I’ve started looking into the idea. The tip about having somewhere to put your legs is key though! So many nice things, I wouldn’t know what to pull out of my closet! Nice work! Happy New Year! 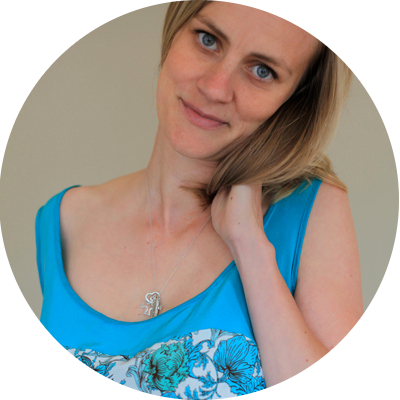 You’ve made a lot of things for a busy working mum Amy. I love your running skirts, and might have to look into making some for me because I practically live in them – even when not running! I am sure your productivity will increase if you move your machine to your family living area. I felt cut off when my machine was in the end room, now it is closer to the lounge I sew a lot more. Happy New Year! You should definitely make some running skirts. It’s fun to be creative with them and to know you’re the only one out there wearing just such a combination. I’m not sure how many running skirt patterns are out there, the one I used is from Jalie, but I’m sure you could draft yourself a pretty nice one if you combined all your favorite elements from the ones you wear all of the time. I’d sure love a pattern like that!